Our useful money boxes make a great gift and they are a very practical option too. The prints and writing can be produced in a of a variety of colours and as they are each personalised to your requirements, we can add a poem or wording of your choice, we have some suggestions for wordings that can be added, or you can choose your own wording to be added to your money box. Once purchased, the kit for taking the prints will be dispatched if purchased with your item, this includes simple step-by-step instructions, simply complete these and return them to us by post or email (if you already have prints for us to use, then you can just upload these to us), we will then set about creating your personalised money box for you, your completed money box will be dispatched to you within 10 days of receiving your completed prints. Don't worry if your prints aren't absolutely perfect, we are able to move parts about, fill in any missing bits and clear up any smudges for you (providing you have purchased the inkless wipe print kit from us). A really lovely, personalised gift that is perfect for a new baby gift, or a Christening / Baptism gift and a fabulous way to encourage saving from a young age and a personal keepsake that will be treasured for years to come. An original Christening gift or a lovely way to mark a baby birth, or even their first birthday gift. We can generally fit two new baby feet on the ceramic money box, or a single hand alongside a poem, or name and birth details and we can change the colour of the prints to match the writing if you'd like us too, or we can print them in contrasting colours, you simply choose what prints colour and what text colour you want on your money box on the order form you will receive after you have placed your order. These great value framed, personalised, baby birth details prints are a lovely, original keepsake fo..
A super way to display your hand print alongside your baby's, a wonderful keepsake for a new parent .. This is our Mug with Footprints or a hand print, the ultimate in personal and useful gifts. Have you..
Baby hand prints and footprints are just fascinating, these beautiful hand and footprint keepsakes a.. These great framed, personalised hand print and footprint art is a great way to capture hand a.. 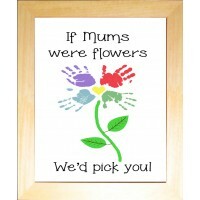 These great framed, Hand Foot Print Art If Mums were Flowers frames are a great way to capture..